Yessssssssss it’s finally here. Go Max, Go DeGrom, Go Castillo. 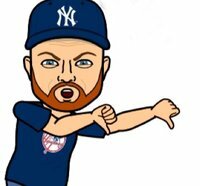 oh and GO YANKEES! Just got traded to the A’s and just like that he becomes 12-team relevant. Counting stats likely to spike in a much better offense. Anyone rushing to the wire to take a shot on him? I like Moncada. Should be in a full time role as opposed to Schwarber possibly getting platooned some of the time.